Revocable trusts and wills are often used in concert. 2. What Are the Pros & Cons of Wills vs. Trusts? 3. Can You Leave Personal Property to a Non-Relative in a Letter? A last will and testament is a document that sets out what you want done with your assets when you die. By contrast, a revocable trust gives away your assets to someone else during your lifetime, allowing the new owner to manage those assets on behalf of a beneficiary. Nevada law establishes different requirements for the two documents. Although you create your last will and testament during your lifetime, it goes into effect only when you die. Because you won't be there to prove that the document really encompasses your last wishes, the law demands a high level of proof that a will is validly executed. In Nevada, you must be at least 18 to make a will. Although the will may be informal and handwritten, it must be an actual, signed document; it cannot be made orally. When you sign the will, there must be at least two people to witness your signature, and neither of them can expect to get something from the will; they must be disinterested. You can revoke your will at any time during your life, usually by making a new will. The revocable trust is also set up during your lifetime, but it begins to operate immediately, while you are still alive. Here's how it works: You legally transfer your assets to someone you've chosen as a trustee. The trustee owns and manages the assets according to your instructions in the trust. Your instructions designate a beneficiary, someone to enjoy the benefits of the trust. The trustee is accountable to this beneficiary. Note the although you usually have the option to revoke the trust during your lifetime, once you die or become incapacitated, the trust will become irrevocable. To make a will or a revocable trust in Nevada, you must be of sound mind. In estate law terms, "sound mind" generally means not only that you are capable of making the will or trust and detailing what you want done with your assets, but also that you are capable of understanding that the document will transfer your assets away. If an interested party has evidence that you were not of sound mind when you executed the will or trust, he may be able to challenge the document and have it partially or completely invalidated in court. While Nevada offers a limited form of probate for estates smaller than $75,000, all wills for larger estates must pass through probate, meaning that the will and disposition of your assets must be approved by a probate court. Probate can be both protracted and expensive. The revocable trust avoids probate, since the transfer takes place during your lifetime. Revocable trusts may also offer both federal and Nevada estate tax advantages. 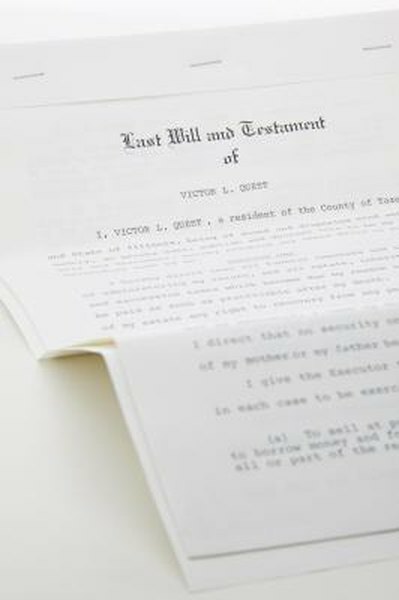 Consequently, many estate attorneys now advise combining a will with a trust as part of a complete estate plan.